The Vengeance Demon Hunter has a variety of playstyles as a tank that gives players a lot of choice in their gaming. They combine the healing of a Blood Death Knight with the mobility of a Protection Warrior or old Brewmaster, with a large number of different synergies and utility. My time spent on the Beta with the spec has been extremely enjoyable, and I have found that while many of the mechanics are familiar, the class has been put together in a very strong – and fun – manner. Please remember that as this guide is based on Beta builds, the Live version may be significantly different. We will update this – and all – class guides once the live release of Legion has come. Enjoy! Haste – reduces the cooldowns on some abilities, including the aforementioned Demon Spikes. 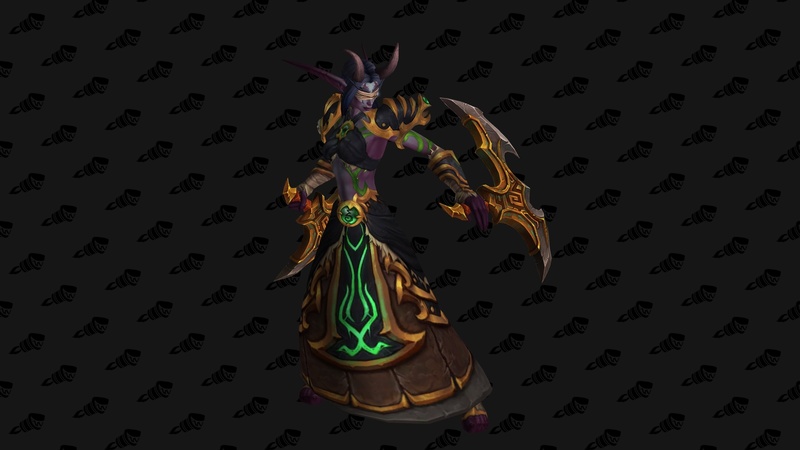 Versatility – because the Vengeance DH’s heals scale with attack power, this will be a good stat to focus on. Crit – increases Parry, which is the main source of passive mitigation for the spec. Leech – increases healing through damage, so like Versatility, this works well for DHs. As a leather-wearing tank, the DH is generally a fairly fragile tank without the use of abilities. To assist with this, Demonic Wards provides an armor increase of 120%, a Stamina increase of 45% and reduces all magic damage by 10% as a baseline. Immolation Aura: on a 15 second CD, this engulfs the DH in flame, dealing both instant damage and dmg/sec over 6 seconds to all enemies within 8 yds. It also generates 20 Pain over the 6 sec duration. Three strong choices for the beginning talent level. All three create an overall damage output increase while also having a movement effect. Abyssal Strike allows for very high mobility for adds that are spread around, while Agonizing Flames gives a strong AoE component along with a good movement boost. Razor Spikes has the potential to be the highest DPS increase, and will be effective for adds that like to move. The Level 100 options deal with the defensive aspects of the Vengeance DH with three different routes to take. Feast of Souls is a passive healing increase, so long as the player can watch for overhealing. Fallout has a lot of synergy with other Soul Fragment talents, but requires a particular style to be effective. Burning Alive is a great defensive increase in fights with two to four major mobs/bosses. All damage increasing abilities, the choice at Level 102 is again dependent on play style. Felblade gives the DH a Warrior Charge + damage, which is handy for instances of spread out enemies. Flame Crash creates even more damage and control while using Infernal Strike, while Gluttony will allow for very large strikes with Soul Cleave – which also means extremely large heals. This tier focuses on the healing and defensive capabilities of the Demon Hunter. Feed the Demon is an excellent talent for players capable of tracking and controlling their Soul Fragments, while Fracture helps in the generation of Soul Fragments. Soul Rending is a passive increase to self healing during Metamorphosis. The 106 Tier revolves around utility. Concentrated Sigils turns the DHs Sigils into something similar to a Paladin’s Aura while removing their ranged capability, while Quickened Sigils allows the use of Sigils more often. Fel Eruption offers an active ability for both dealing damage and crowd control at a 35 yard range. 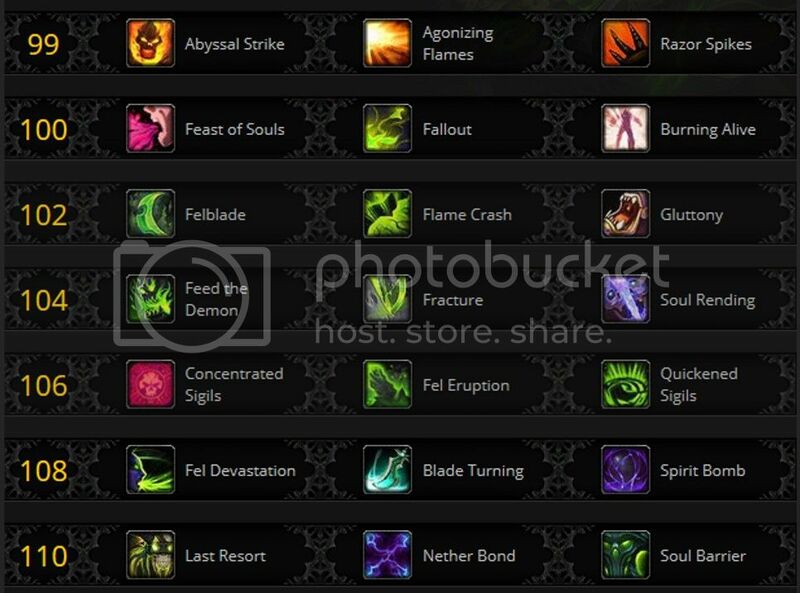 This tier allows the Demon Hunter to choose talents that will assist in the defensive mechanics of the spec. 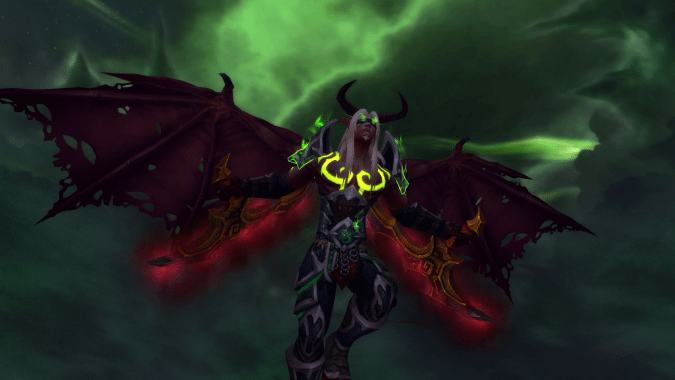 Fel Devastation is a frontal AoE that does both damage and creates a new source of self-healing, while Spirit Bomb allows the Demon Hunter to use Soul Fragments in a new way. Blade Turning is a passive effect that will assist those players having difficulty with Pain generation. The final tier of talents all involve defensive capability assistance. Last Resort functions as a ‘Cheat Death’ effect, while Nether Bond allows a group to manage damage spikes through health redistribution like a Spirit Link totem. Soul Barrier grants another an active shielding mechanic that protects against both physical and magic damage. This build focuses on close contact with all targets and utilizing the improvements to Demon Spikes as a strong defensive mitigation. This would be closest to a Warrior build, with charges and active defensive cooldowns, along with an increase to resource generation. The focus here is on using and generating Soul Fragments to augment both offensive and defensive abilities. Agonizing Flames and Concentrated Sigils would provide damaging AoE effects, while the other abilities allow the player to utilize Soul Fragments to both heal and provide offense. The high movement ability of Infernal Strike is the key to this build, allowing the player to jump more and inflict higher AoE damage on each jump. This would be effective for an offtank role, or in a dungeon/raid where there are many enemies all spread out. 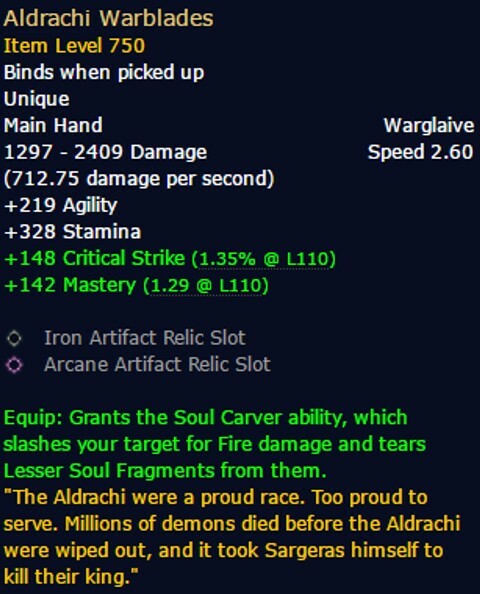 The Vengeance Demon Hunter’s artifact weapon is the pair of Aldrachi Warblades. Every new artifact weapon in Legion comes with it’s own specific talent tree that offers both a new active ability and a number of choices to enhance and increase other class specific abilities. Every class starts with the new active ability, and then the choice on how to proceed down the paths is entirely up to the player. 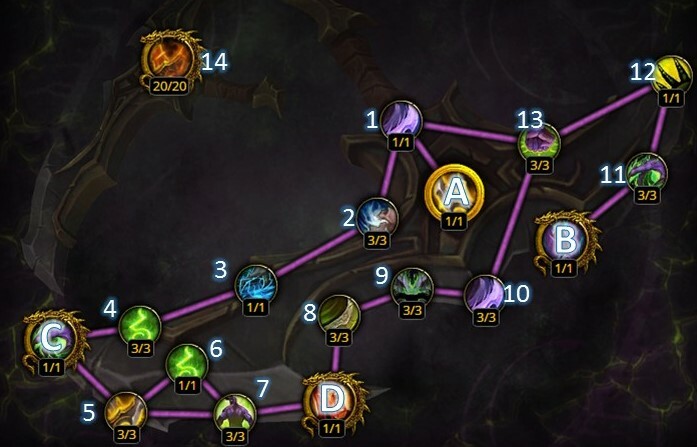 The Vengeance Demon Hunter artifact tree has 4 major talent choices, 13 minor and one final ‘epic’ choice that can be filled once the rest of the path is completed.